Intermodal transportation has been around since Malcom McLean put a highway trailer on a ship in North Carolina in 1955. In its simplest form, this is the act of converting from one mode of transportation to another. When a passenger gets off of a plane and boards a bus, this is intermodal transportation. In the world of freight movement, it’s the same idea – moving freight from one mode to another. This could be airfreight from a cargo plane to a truck or it could be the act of placing a truck trailer on a ship for intercoastal transportation, like Malcom did. When we talk about intermodal in the Midwest we usually mean the conversion of highway traffic to a railcar. This is done either with a highway trailer on a flatcar or placing a domestic or ocean container on a stack train made up of specialized articulated railcars that enable the vertical stacking of the containers on each platform of the car. The wheels or chasses stay behind. U.S. railroads set an intermodal traffic record in August 2013, according to Association of American Railroads (AAR) data. Volume was 1,031,179 trailers and containers, making it the best intermodal month in history. Why? Service improvements by railroads providing consistent scheduled service. PS and LTL carriers demanding and getting better service from the railroads. Truckload carriers led by J.B. Hunt embracing the system. With government regulations already shrinking the number of available truck drivers, the new Federal Motor Carrier Safety Administration’s HOS regulations shortening the amount of time a driver can drive have taken further capacity out of the nation’s trucking industry. It now makes sense to take a loaded domestic container to a railroad’s intermodal terminal, where the container is lifted onto a train and transported to its destination, lifted back onto a chassis and delivered to the consignee. In short, the regulatory climate has forced carriers to find ways to deal with the driver shortage in long haul freight movement. So how does this help Kansas City? Kansas City and the surrounding area have available land and competitive labor for cost-effective distribution center operations. As shippers look at the 10 to 15 percent reduction in driver productivity due to regulatory changes they may find that they need to create more stocking locations (distribution centers) in order to get their orders to the customer on time. 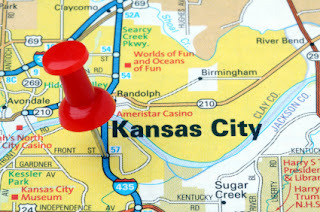 With excellent highway connectivity north/south and east/west and a relative lack of congestion versus Chicago and other large metro areas, Kansas City is an excellent choice for a distribution center. With the Union Pacific and BNSF western railroads and the Norfolk Southern eastern railroad, plus the north/south KCS rails combining in Kansas City, intermodal has a bright future in the region. What effect does the reshoring trend have on the Kansas City area? Technology innovations in robotics and other manufacturing techniques, creating an equalizer effect, and offsetting low-cost labor overseas. A shorter supply chain not affected by higher costs and uncertain ocean transit times. Rising wages in China, South Korea, and other Asian countries. Aggressive state government programs offering incentives to help companies locate in our region. Abundant and reasonably priced energy as U.S. oil and gas resources are further developed. When these companies look for a site for their plant, they will find a good choice in the Kansas City region for the same reasons companies are siting distribution centers here. At Wagner Logistics, we are happy to work with companies in operating a distribution center to provide materials management to their plant or a retail vendor performing omnichannel fulfillment to both big-box retailers and consumers; we love the challenges they bring. In addition, Wagner’s transportation logistics group provides the trucks and carrier capacity to get the order where it needs to be on time, every time. About Wagner Logistics: Wagner Logistics is a leading supply chain management provider offering distribution center, fulfillment and transportation services across the United States. Current offices include Jacksonville FL, Cleveland OH, Pine Bluff AR, Dumas AR, Dallas TX, and Kansas City MO and KS. Wagner combines high-tech tools with high-touch product pampering to ensure that inventory is where it needs to be, when it’s needed, in the condition customers expect. From product displays to complex fulfillment to vertical supply chains for fragile products, we want to tackle your biggest challenges. Bring it!